If you are contemplating about having a pet at your home, make sure that you have made a thorough research to check if you can handle the great responsibility of being a pet-owner especially if you have a child. It is not enough that you love animals. You should have at least an idea how to give the proper care and nourishment to them so they will stay healthy and happy with your family. The following list of advantages and disadvantages will help you decide whether or not you are ready to adopt a pet. It helps you develop stronger bonds with your family. Pets are so playful that even if you are doing something, you will be swayed to cuddle and play with them. More so if you see your child happily running with your pet. Having a pet will surely make your family day more fun and entertaining. Your child always has a companion. Your child will never get bored even if you are doing something; you know that your child is just playing with your family pet. You do not have to worry much about the tantrums because according to the study, children can easily forget their irritabilities if they have a pet. Pets are entertainers by nature and once they started to play, they would not mind anything that has made him cry earlier. Your child can learn to be more responsible. They will love to feed their pet; they will want to bathe it and to take care of it. As a parent, you will love seeing your child do little chores like this. Being responsible starts at home, with small little things like taking care of a pet. 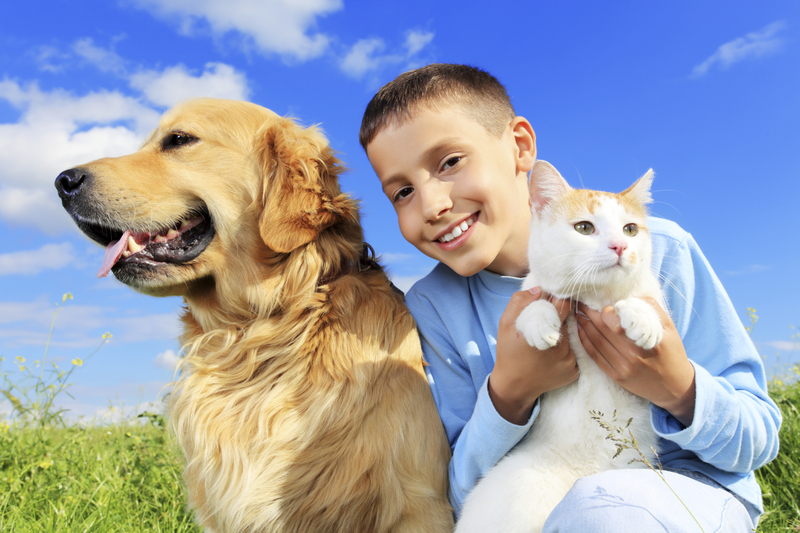 Pets have health benefits to your child. Experts agree that pets at home have several health benefits, especially for the emotional growth of a child. If there is a pet in the house, he will learn how to control his temper. When it comes to physical growth, it helps your child enjoy running and exercising. You and your family feel safe if you have a dog in your house, especially a barking or well-trained dog. It helps your child overcome depression. If they come home from a very stressful day in school, a little hug and kisses from a pet could help your child forget what has happened earlier. It is proven that pets are a great stress reliever. Even if a pet is domesticated, you cannot expect him to behave like a real person. Sometimes, animals have a temper, especially if they are hurt. Thus, you should take necessary precaution to make sure that your child is not bitten. It can be costly. Owning a pet is like adopting a child. It has to be well planned and you should be ready to commit not only your time, but also your money to make sure that he is always healthy. Buying essential grooming kits for pets, food, and other accessories like collars and leash can be very expensive. Even if it has several health benefits, it also has some drawbacks, especially if one of the family members has allergies. So, before bringing home a pet, make sure that you have consulted a medical doctor, especially a pediatrician for your child. Medical history of parents can help determine if children have the same allergic problems. Incorrect choice of kind, size, and breed of animals at home can bring danger to life. So, before making any decision about buying or adopting any animal, take into consideration your family, especially your child’s safety. It needs your time. You cannot expect that your child will be very dedicated in caring for your new pet. A child loses focus easily and they cannot handle too much responsibility like caring and feeding a pet. They will just love playing and cuddling with them, but do not expect that they will clean the pet pen by themselves. Aside from not being able to handle this kind of chores at an early age, it is also unsafe for them because they might get diseases from poop and other dirt. The advantages of having a pet at home have more weight than the disadvantages. However, you should still remember that as the pet owner, you have to be responsible in taking proper care of your pet. It includes proper grooming. Make sure you take the time to visit a professional pet salon like Petco to make sure that your little pet will have an enjoyable and relaxed grooming session. This can also be a bonding moment with your family. Seeing your pet being washed and groomed by professionals is very enjoyable to watch and your child will surely love it. An amazing blog. Every dog owner should know about the advantages and disadvantages of having a pet. While owning a pet is a wonderful experience, just make sure you’re prepared for the responsibility. Before really purchasing a pet, consider fostering one for a half a month to get the feel for what kind of schedule you’ll have to keep.